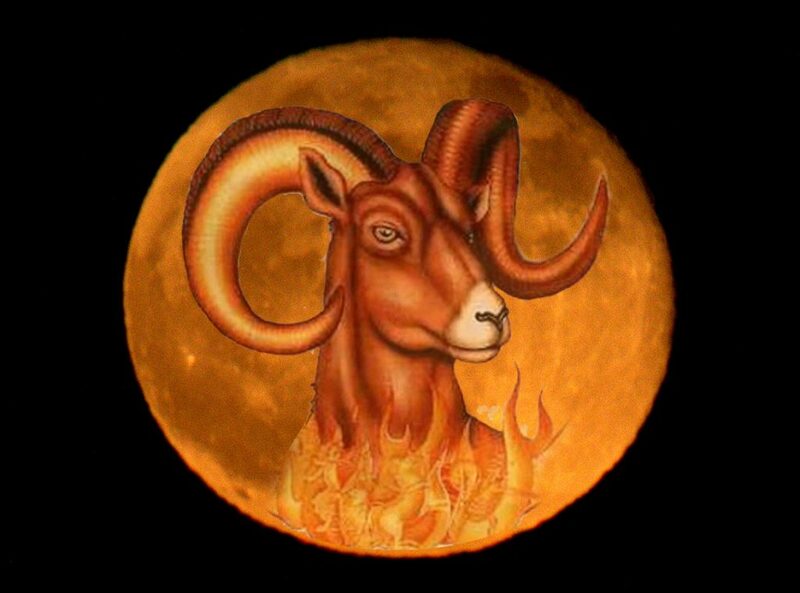 On Sunday, October 16 early in the morning the Moon reaches its Full Phase in Aries, first Sign of the Zodiac, Element of Fire (energy and transformation). Aries symbolizes the Seeker, experiencing life as a means to know oneself. Aries wants to assert its individuality, its uniqueness. Aries perceives existence as a struggle to survive. It is always on the move, full of energy and new projects, finding out ways of expressions not yet explored. These are the issues brought about by the Full Moon for the next 2 weeks. When the Moon gets full, the Sun is enlightening it from an opposite position, in this case from Libra. Moon and Sun are there, face to face, Female and Male facing each other, dark and light, void and matter. While interfacing, their Archetypes are giving shape to a dialogue between polarities, building up a rainbow bridge including every possible nuance. So no aspect of the Self is left behind. Every month is like a path developing along a growth in consciousness lead by our satellite beaming down to us from a different Zodiac Sign. A new pattern is traced by the New Moon, when the Moon is dark and conjuncts the Sun. Then, during the transition between darkness and a renewed brightness, here on Earth we are experiencing a certain issue, depending on the astrological positions. In October the New Moon was in Libra, placing main priority on relationships. Libra has an open issue with loneliness, therefore accepting too many compromises with others, mostly inside the couple. So the question was: what does it mean to be oneself? When is it possible to consider a relationship healthy? Are we uncomfortably in need of the other or rather do we think our couple can have a good life? But above all, can we accept the idea that what we cannot stand in another person is exactly what we do not like in ourselves? We can hold this vision? We should be grateful to those next to us, for they allow us to experience who we are, and they mirror that back, with a great accuracy. During the process of the Crescent Moon, our satellite is moving away from the Sun, until they reach an opposition. And that’s the magic. In that transforming phase there is the reflection within us of a the process of individuation, when we are shaping our uniqueness. A Human never wants to be on his/her own, that is natural. Yet the care we give to ourselves, choosing to love what we do not like of our aspects, our own shadow, is the answer to so much sorrow and pain caused by a lack of love. We are the only ones that can heal our wounds, learning to find an expression for every colorful flow rising from depths, listening to the natural poems our heart treasures, nourishing our minds with beautiful visions. Our partners are there to awake our awareness about ourselves and the relation we are entertaining with who we really are. This Full Moon, down to the next New Moon in november, is a lesson to learn how to accept, how to breathe in the freedom of being with someone we love and care despite the conflicts. Because those conflicts are nothing but a reflection of what we carry within. If we learn to make peace inside, our relationship with the other changes drastically and we can be free to choose.